در این تحقیق، رفتار آزمایشگاهی تیر عمیق بتن مسلح که با ورق پلیمر مسلح شده با الیاف کربنی (CFRP) به دو روش نصب خارجی (EB) و روش نصب در شکاف نزدیک سطح (NSM) مقاوم‌سازی برشی شده، مورد بررسی قرار گرفته است. برای این هدف، 6 تیر به طول 145 سانتی متر، ضخامت 15 سانتی متر و ارتفاع50 سانتی متر ساخته شده و تحت آزمایش قرار گرفتند. آرایش ورق CFRP روی جان همه تیرهای مقاوم‌سازی شده، بصورت قطری و عمود بر خط واصل بین زیر بار تا محل تکیه گاه می باشد. نمونه‌ها به دو گروه با توجه به میزان فولاد مسلح کننده برشی تقسیم می شود؛ هر گروه دارای سه تیر می باشد که تیر اولی تیر کنترل و مقاوم سازی نشده، تیر دوم با روش EB مقاوم سازی شده و تیر سوم با همان مقدار ورق CFRP با روش NSM مقاوم سازی شده است. همه تیرها تا مرحله گسیختگی بارگذاری شده و در حین بارگذاری مقدار کرنش بتن فشاری، کرنش فولاد کششی، عرض ترک و تغییر شکل وسط دهانه تیر اندازه گیری شده است. نتایج آزمایش نشان می دهد که ظرفیت باربری و تغییر شکل نهایی تیرهای مقاوم سازی شده با روش NSM به ترتیب تا 18 درصد و 16 درصد بیشتر از تیر کنترل می باشد. همچنین ظرفیت باربری و تغییر شکل نهایی تیرهای مقاوم سازی شده با روش NSM به ترتیب تا 6 درصد و 15 درصد بیشتر از تیرهای مقاوم‌سازی شده با روش EB می باشد. میزان کرنش فشاری بتن در حالت نهایی در ناحیه خمش ثابت در تیرهای مقاوم‌سازی شده با روش NSM حدود 50 درصد بیشتر از تیرهای مقاوم‌سازی شده با روش EB میباشد. This paper presents the test results of an experimental study that investigates the behavior of RC deep beams strengthened in shear with externally bonded (EB) and near surface mounted (NSM) techniques using CFRP strip. A total of 6 RC deep beams were constructed and tested under four-point bending. Test specimen had a cross section of 150 × 500 mm and a total length of 1450 mm. This study included two parameters; techniques (NSM and EB) used for strengthening and amount of shear steel reinforcement ratio. All of the strengthened beams have the same CFRP configurations; and CFRP strips were bonded perpendicular to the diagonal connecting the loading and the support points. The specimens were divided into two groups based on the shear steel reinforcement ratio. There were three beams in each group. One of them was a control beam, the rest of the beams in each group were strengthened by EB or NSM techniques. The amount of CFRP strip in EB and NSM techniques is equal. All of the beams were loaded until failure and during the experiment, deflection and compressive strains of concrete, tensile strain of longitudinal steel bar at mid span and crack width of flexural and shear, were measured. The test results showed that shear strengthening of the deep RC beams with NSM technique causes to increase in ultimate load capacity and ultimate deflection capacity by 18% and 16% respectively, compared with the control beam. Also, the ultimate load capacity and ultimate deflection capacity of deep RC beams strengthened with NSM technique are 6% and 15% more than beams strengthened with NSM technique respectively. The concrete compressive strain at ultimate load of deep RC beams strengthened with NSM technique is 50% more than beams strengthened with NSM technique. Subedi, N.K., Vardy, A.E. and khota, N. (1986). Reinforced concrete deep beams- some test results. Magazine of concrete Research, 38(137):206-219. Shear Reinforcement. Concrete Research, 7(2):17-30. Ershadi, S. (1996). the investigation of behavior and failure modes of simply supported deep beams with the span to depth ratio between 2 and 3. Master's thesis, Iran University of Science & Technology. Kong, F.K. (1990). Reinforced Concrete Deep Beams. Glasgow and London: Blakie and Son Ltd.
 EN 1992-1-1.2004., (2004). Design of Concrete Structures. British Standards Institution, London, UK. ACI 318-14. (2014). Building Code Requirements for Structural Concrete and Commentary. American Concrete Institute, Michigan, USA. CSA A23.3-94. (1994). Design of concrete structures. Canadian Standards Association, Toronto, Canada. Code No.524, (2010). Guideline and Details for Seismic Rehabilitation of Existent Building. Management and Planning Organization, Tehran, Iran. Teng J.G., Chen J.F., Smith S.T. and Lam L. (2002). FRP strengthened RC structures. New York: Wiley. Balaguru, P., Nanni A. and Giancaspro J. (2009). FRP composites for reinforced and prestressed concrete structures. New York: Taylor and Francis. Akbarzadeh H, Maghsoudi A.A. (2010). Experimental investigations and verification of debonding strain of RHSC continuous beams strengthened in flexure with externally bonded FRPs. Materials and Structures, 43(6): 815-837. Ghasemi, S., Maghsoudi, A.A., Akbarzadeh Bengar, H. and Ronagh, H.R. (2015). Sagging and Hogging Strengthening of Continuous Unbonded Posttensioned HSC Beams by NSM and EBR. 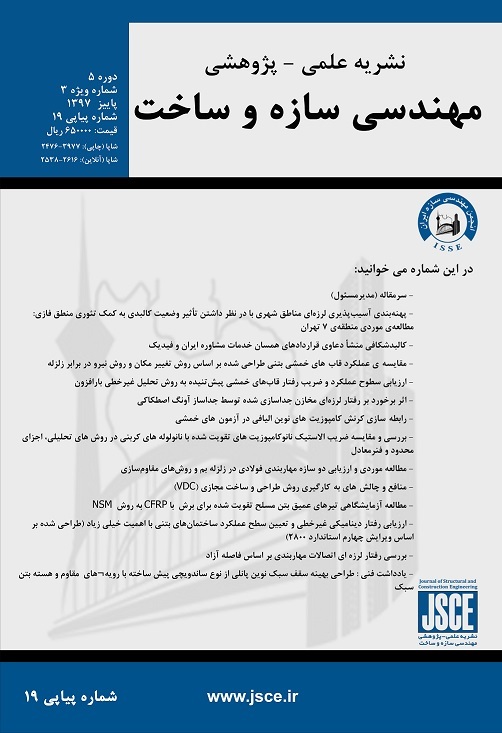 Journal of Composite for Construction, ASCE, 20 (2): 04015056. Islam, M.I., Mansur, M.A. and Maalej, M. (2005). Shear strengthening of reinforced concrete deep beams using externally bonded FRP system. cement and concrete composites, 27(3):413-420. Zhang, Z., Hsu, C. and Moren, J. (2004) Shear strengthening of reinforced concrete deep beams using carbon fiber reinforced polymer laminates. Journal of Composite for Construction, ASCE, 8(5):403-14. Arabzade, A. and Mahanpoor h. (2011). The Experimental Study of the Effect of FRP Laminates on Shear Strength of RC Fixed Ended Deep Beams. Modares Civil Engineering Journal, 11(2):69-78. Asghari, A., Beygi M.H, Navayineya, B. and Asghai, A. (2011). Evaluation of shear behavior of reinforced lightweight concrete deep beams strengthened with CFRP and GFRP composites. ASAS Journal, 13(27):74-85. Burningham, C.A., Pantelides, C.P. and Reaveley, L.D. (2015). Repair of reinforced concrete deep beams using post-tensioned CFRP rods. Composite Structures, 125:256-265. Hussain, Q. and Pimanmas, A. (2015). Shear Strengthening of RC Deep Beams with Openings using Sprayed Glass Fiber Reinforced Polymer Composites (SGFRP) : Part 1. Experimental Study. KSCE Journal of Civil Engineering, 19(7):2121-2133. Arabzade, A., Amani, A. and Mahmodzadeh, I. (2015). Experimental Study of prestressed RC Deep Beams retrofitted by CFRP. Modares Civil Engineering Journal, 15:117-127. ACI 440.2R-08, (2008). Guide for the Design and Construction of Externally Bonded RP Systems for Strengthening Concrete Structures. AmericanConcrete Institute, Framington Hills, Michigan, USA. El-Gamal, S.E., Al-Nuaimi, A., Al-Saidy, A. and Al-Lawati, A. (2016). Efficiency of near surface mounted technique using fiber reinforced polymers for the flexural strengthening of RC beams. Construction and Building Materials, 118:52-62. Bilotta A., Ceroni F., Nigro, E. and Pecce, M. (2015). Efficiency of CFRP NSM strips and EBR plates for flexural strengthening of RC beams and loading pattern influence. Composite Structures, 124:163-175. Bilotta A., Ceroni F., Nigro E. and Pecce M. (2014). Strain assessment for the design of NSM FRP systems for the strengthening of RC members. Counstruction and Building Materials, 69:143-158. Bianco, V., Monti, G. and Barros, J.O.A. (2014). Design formula to evaluate the NSM FRP strips shear strength contribution to a RC beam. Composites: Part B, 56:960-971.